After you have selected a plan to edit or view, you are directed to the Draw tab. Here, you see tools for managing what you see in the map layers, editing districts, manipulating districts, and district statistics. All of these are important features to understand as they will enable you to draw a legal redistricting plan. Perhaps the first thing you may notice about your map is that districts are colored. Closer examination reveals that the counties and other geographies that underlay the districts are also shaded. These colors are intended to provide you with clues and tools that enable you to draw legal redistricting plans. The Map Legend button on the lower right corner of the map provides a legend of the information displayed about the districts and the underlying geography. This information is described below in more detail. Essentially, there is information about the underlying geographies that you are creating districts out of and information about the districts themselves. The district boundaries and boundaries of the underlying geographies they are drawn out of are known as Map Layers. 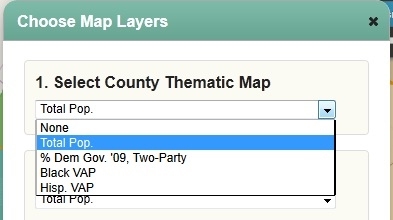 Although not immediately visible when you first begin editing districts, you can overlay additional reference layers such as community maps and other redistricting plans. You can configure the map layers by clicking on the Set Map Layers icon. The first pull down box in the Choose Map Layers dialog box allows you to change how the editable geographies are shaded. By default, counties and other editable geographies are often shaded by their total population. The same is true for any other editable geographies such as census tracts, census blocks, or precincts and wards (the available geography is determined by the administrator). The allowable shadings will vary with the available data in each state and it is possible to turn off the shadings by selecting "None" which may be useful if you wish to create printable maps. Total Pop. is the total number of persons in a district. The federal and some state constitutions require that districts have equal population -- the degree of equality depends on the type of district (congressional or state legislative) and upon state law. Black VAP and Hisp. VAP is the Black and Hispanic Voting-Age Population (Black and Hispanic are Census Bureau terms). The voting age population is everyone age 18 and older. The number of minorities of voting-age within districts is an important statistic to pay attention to for districts to comply with the federal Voting Rights Act or similar state requirements. The administrator may enable shading of geographies by other racial and ethnic categories. % Dem Gov. '09, Two Party is an example of election data that may be available. Typically in redistricting, statewide races are used to evaluate the underlying partisan strength of districts, which is one factor to determining which parties' candidates are favored to win within a district. By "Two Party" we mean the vote for the Democratic and Republican candidates only -- this is typical in redistricting as the vote shares for the major political parties are most meaningful to the election outcome. The administrator may enable shading of geographies for more electoral contests and votes for minor political parties. Keep in mind that there is a lot of racial, ethnic, and political data that can be made available. These are illustrative examples used for a redistricting competition in Virginia. You can see what the shading for the geographies means by clicking the Map Legend button in the lower right hand corner of the map editing area. The second pull down box in the Choose Map Layers dialog box allows you to change how the districts are shaded. By default, districts are usually shaded by their total population -- and how close they are to the ideal population for that legislative body. (The ideal population is the total population of the state divided by the number of districts in the legislative body.) The administrator may enable districts to be shaded by other values, such as the districts' compactness and contiguity status. You may also choose to have no shading for the districts, which may be useful if you wish to create printable maps). The map above illustrates how districts may be shaded. Here, districts are shaded by how close their total population is to the ideal district population. The gold (or blue) colored districts are above the ideal population, with darker colors indicating that the districts are further from the ideal. A district that is not shaded is within the population tolerance set by the administrator. You can see what the shading for the districts means by clicking the Map Legend button in the lower right hand corner of the map editing area. Reference layers are geographies that can be displayed, but cannot be used directly to edit districts. You can follow the boundaries of reference layers by selecting editable geography contained within them, so they can be useful to guide you indirectly during your map making. A reason why reference layers cannot be used to directly edit districts is that that they are not guaranteed to be nested within the hierarchical geographies of the database. Allowing editing of non-nested geographies would significantly slow the performance of the software. There are two types of reference layers, those that are editable geographies and those that are of other existing maps, be they redistricting plans or community layers. When zoomed in, lower levels of geography will appear for editing, for example, counties, census tracts, precincts, and census blocks. The boundaries for geographies other than the one currently editable can be displayed by choosing the available geographies in the third pull down box Choose a Reference Layer in the Choose Map Layers dialog window. The administrator selects the available reference layers for viewing. 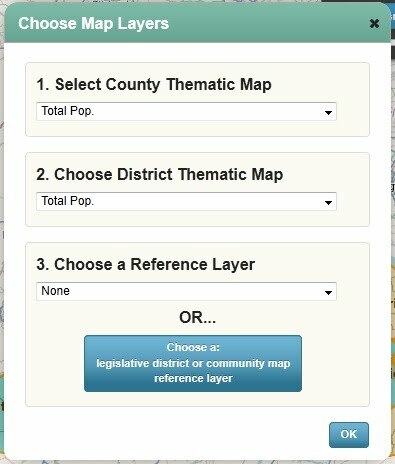 Other legislative districts or community maps can be displayed as reference layers by clicking on the Choose a: legislative district or community map reference layer button in the Choose Map Layers dialog window. Clicking this button will reveal a file manager that is similar in character to the plan chooser. 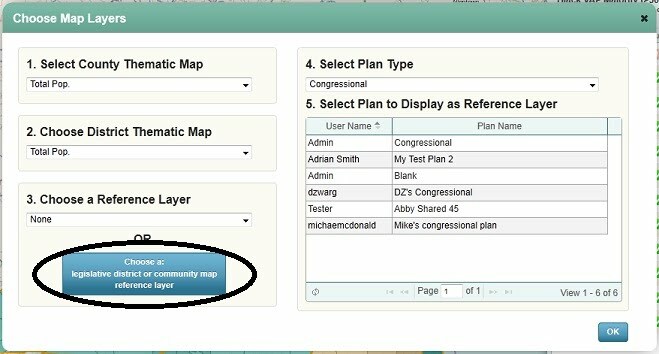 From here, you can select a redistricting plan for a legislative body or a community map that either you are privately working on or that other users have shared. To select a reference layer for display, choose one of the available map types on the Select Plan Type drop drown box. Usually these will be congressional plans, state legislative plans, and community maps. By default, congressional plans will be typically displayed. 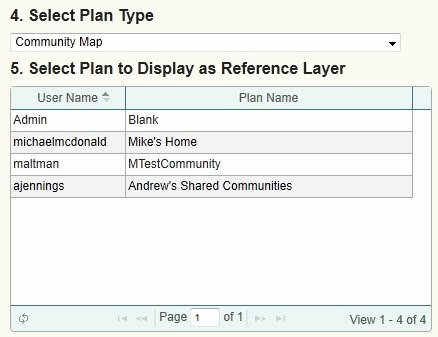 Once you have selected a plan type, the Select Plan to Display as Reference Layer will populate with the available plans. The plans can be sorted by the user name and plan name by clicking on the column headers, and you use the navigation buttons at the bottom of the plan list to display additional plans. When you are satisfied with the shading of your map editing environment and the layer that you wish to display, click on the OK button to return to mapping. If you have selected a reference layer, its name will be displayed in the Road Display Dialog Box located in the upper right hand corner of the mapping area. The geographic layer that you can edit is tied to the zoom level. When zoomed far out, only counties will be visible for editing. As you zoom in other editable geography will become available, such as census tracts, Voting Tabulation Districts (a generic term for precincts, wards, election districts, etc. ), and census blocks. We tie the editable layer to the zoom level since this avoids the problem of showing the many census blocks for an entire state -- the amount of data involved would slow the program considerably. To move the view area in a north/south/east/west direction, use the pan tool located in the upper left hand corner of the mapping area. Click the pan tool (the hand icon on the Edit Map tools). This is the default editing tool when you first enter the mapping screen. Click on the mapping area and hold down the mouse button. Move the cursor while holding down the mouse button. There are three ways to change your zoom level. To zoom in about out using the zoom slider tool located in the upper left hand corner of the mapping area, click on the plus or minus sign to zoom in or out, respectively. Or, click on the slider and move it to the desired zoom level. To quickly change your zoom level to the entire jurisdiction, click the round icon at the center of the pan tool. Click the Pan tool (the hand icon on the Map Editing tools). This is the default editing tool when you first enter the mapping screen. While holding shift, click on the mapping area and hold down the mouse button. A rectangle will display on the map. This rectangle represents the area you will zoom to. When you are satisfied with the area you wish to zoom to, release the mouse button. Displayed underneath the districts, editable geographies, and reference layers is a map layer of roads, cities, and other features that provides helpful context to a mapping session. The administrator may make various maps available to you: Open Street Map (or osm), Google Maps, and Bing Maps. Select a preferred street map by clicking on the appropriate button on the Road Display Dialog Box located in the upper right hand corner of the mapping area. There are licensing restrictions on Google and Bing, so your administrator may choose not to make these street maps available. You can increase or decrease the transparency level of the districts and the editable geographies by moving the roads transparency slider in the Road Display Dialog Box. If you have selected a reference layer, its name will be displayed in the Road Display Dialog Box. There are two sets of mapping tools available in two tabs at the top of the mapping area. The Map Editing tools are for selecting and assigning editable geographies to districts. The District Tools are additional mapping utilities. Select tool set by clicking on the desired tab. There are four tools that are available in either tool set, the Pan Tool and Info Tool, which are for navigating around the map. You can move your map view with the pan tool. Select the hand icon, click and hold down the mouse button, and move the cursor. The Info Tool allows you to click on an editable geography and see it's name and the census and political data associated with it. Any edit can be undone by using the Undo/Redo Tool. The icon on the left will undo an edit and the icon on the right will redo an edit. If an edit is made after an undo action is performed, the redo action will no longer be available. Undo of multiple edits is allowed. The Map Editing tools are for selecting and assigning editable geographies to districts. The mapping task is divided into two steps. First, editable geographies are selected and second they are assigned to districts. There are two different types of tools for this task, selection tools and assignment tools. While selection and assignment tools can be simultaneously selected, it is important to remember these are two different types of tools. If the software appears to be behaving unexpectedly, it can be often useful to review the selection and assignment tools. The three Select Tools enable you to select geographies for assignment to a district. You can select individual editable geographies or collections of editable geographies, depending on which tool you use. If you attempt to select a large number of geographies with any selection tool, you will receive an error message to select fewer geographies. When working at the census block level, it is often easy to select (and fail to select) many geographically small zero-population road and water segments, so be careful when working at this level. Often, a clue that something has happened is that you will be warned that a district is non-contiguous. We provide additional District Tools to help you with this, what can be at times, tedious task. Click the Single Select tool icon. Click the editable geography you wish to select. By holding down "shift" while you click, you may add more geographies to your selection. Click the Rectangle Select tool icon. Click and hold the mouse button over the area you wish to select. While holding the mouse button, drag the mouse over the area you wish to select. A rectangle will be visible. When satisfied with your selection, release the mouse button. All geographies that touch the rectangle will be selected. Click the Polygon Select tool icon. While holding the mouse button, drag the mouse over the area you wish to select. Unlike the Rectangle Select Tool, you draw a freehand shape. Your selection area will be visible. When satisfied with your selection, release the mouse button. All geographies that touch the selection area will be selected. The heart of mapping is assigning selected geographies to a district. There are two methods that we use to perform this task, the Anchor District assignment tool and the Click and Drag assignment tool. The District Anchor Assigning Tool is also the tool that we use to create new districts, if there are still empty slots. The number of district slots is set by the administrator and typically will not exceed the maximum number of districts for a particular legislative body one is drawing districts for. The District Anchor assignment tool acts like a paint brush. Any geography that is selected is automatically assigned to the district the anchor is associated with. You may associate the District Anchor with three different types of "districts"
An existing district. All selected editable geographies will be assigned to the associated district. Unassigned geography. All selected editable geographies will be assigned to no district. A new district. All selected editable geographies will be assigned to a new district if a slot is available. See Creating a New District below for more information. select the district from the pull down list to the immediate right of the Anchor District icon. Use a selection tool to select geography. It will be assigned to the district associated with the Anchor District assignment tool. Use a selection tool to select editable geography. Once the geography is selected, it will be highlighted in yellow. Click on the Click and Drag icon. Click on the selected geography. While holding down the mouse button, move the selected geography to the desired district. A common error occurs when you drop the geography back into the district it is currently assigned to. When this happens, you will receive the message "No Districts Updated." Sometimes people prefer starting from a blank map or are working for a partially completed map, perhaps because they have removed a district in a slow growing area of a state. The Anchor District assignment tool can be used to create a new district. To create a new district, you must have a free district number to assign to. Associate the Anchor District assignment tool to unassigned. Select all of a district's geography and change it to unassigned. 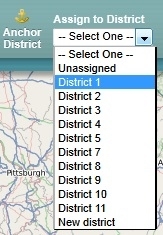 Use the Unassign District tool to unassign all of district's geography in one step. See the Unassign District tool, described below. In certain circumstances an free district number may be already available. For example, such a free district may be available in a state that has gained one or more congressional districts and the starting map is the current congressional districts. Use a selection tool to select editable geography. You will be presented with a pop up window that asks which new district you wish to assign the geography to, among the available slots (in this case there is only one option, District 6). Select the district you wish to assign the geography to and click "OK". The District Tools set may be accessed by selecting the District Tools tab. These are utility tools that may be helpful to map editing. The Lock District tool allows you to click on a district and toggle it between being locked and unlocked. 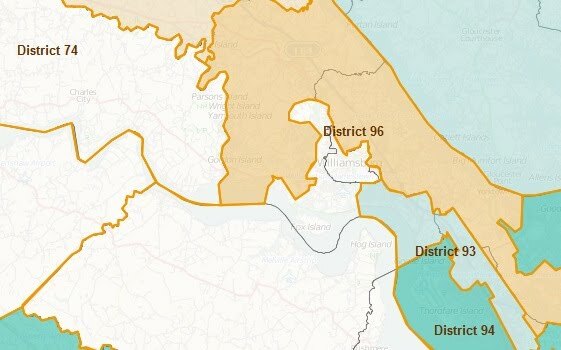 No changes may be made to a locked district. Locked districts are highlighted in red. This is tool is useful when a good district has been created and you want to make ensure no inadvertent changes are made to it. The Lock District tool can also be useful to quickly select editable geography that has been split by districts. For example, if you wish to assign the portion of a county split by two districts, lock one of the two districts and select the county. Only the unlocked geography within the county will be selected. The Lock District tool can sometimes be useful to find stray non-contiguous pieces of districts. The red outline of locked districts may be more visible than the unlocked gold colored outline. A highlight district tool is similarly useful for this purpose. The Lock District can cause delays in selecting editable geographies. When a geography is selected that includes or is bounded by one or more locked districts, the software must identify all intersecting geographies with the locked district. If you notice significant slowing, you may want to unlock adjoining districts, if possible. The District Info tool shows the district number of the selected district. The District Info tool is useful when district labels are not be visible or readily apparent, particularly when zoomed in. The Unassign District tool allows you to unassign an entire district. This is useful when used in conjunction when creating a new district using the Anchor District tool or when using the district Copy and Paste tool, which both require an unassigned "slot" to copy a district into. Click the Unassign District icon. Click on the district you wish to unassign. Confirm that you wish to unassign the district in the pop up box. The Copy and Paste tool allows you to copy an entire district from a plan you are able to view -- any plan you can see in the Template, Shared, or My Plans file listings. There are two important steps before attempting to copy and paste a district. You must have an empty district slot to copy the district into. The software is configured to draw a specific number of districts for a legislative body, determined by the administrator. Clicking on the Copy and Paste tool when at the maximum number of districts will produce a warning message that the maximum number of districts has been reached. 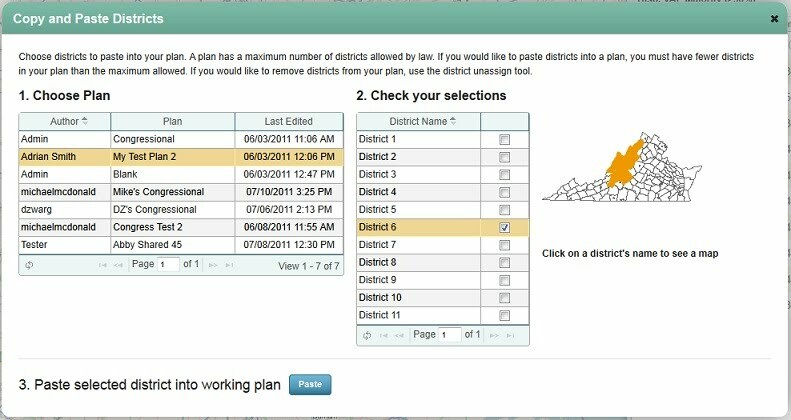 To free a district slot, either use the Unassign District tool to quickly unassign all editable geographies associated with a district or use the District Anchor tool to manually unassign the all editable geographies associated with a district. We recommend that you identify the specific plan and district that you wish to copy from before using the Copy and Paste tool. There are three steps to copying and pasting a district. Choose the plan that you wish to copy the district from. The listing interface is similar to the Select Plan management interface. You can sort plans by the user, plan name, and date of last edit. Navigation buttons are available if the number of plans exceeds one page. Select one or more districts in the plan that you wish to copy into your current plan. Remember, that you must have enough free district slots to copy the district(s) into. A preview pane on the right will display a reduced-size image of the district you wish to copy. Note that working with small-sized districts in densely population urban areas, the preview may not be informative. We recommend that you note the plan name and district numbers you wish to copy from before invoking the Copy and Paste tool. When satisfied with your selection, click the "Paste" button. When the Copy and Paste tool is invoked the copied district will overwrite any district in the target plan that is not locked using the Lock District tool. Often, there will be unassigned geography left over after a Copy and Paste procedure is completed. We recommend that you assign these geographies soon after a completing a Copy and Paste as you may otherwise forget about them. You can undo any edit, including one using the Copy and Paste tool, using the Undo tool. You may wish to draw a plan that minimizes the number of times districts split geographies, such as counties, communities, or districts for other legislative bodies. The Show Splits and Generate Splits Report are useful tools to draw districts that or any boundary that can be shown as a reference layer. If a reference layer has been selected using the Map Layers, clicking the Show Splits icon will visually show all districts that split the selected reference layer. The districts will be highlighted in blue on the map and the statistics sidebar. You can remove the blue highlights by clicking on the district on the statistics sidebar. Clicking the Generate Splits Report icon will invoke the Splits Report dialog box. The Generate Splits Report creates a list of all the geographies split by each district, with some options described below. Up to three reference layers can compared against the current plan's districts to identify splits. 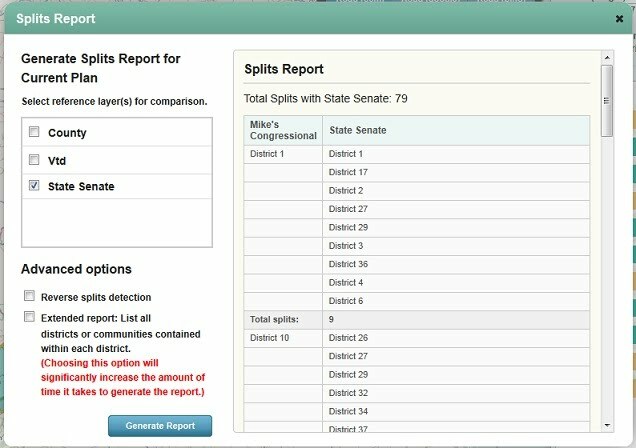 By default, counties and one lower layer such as census tracts or VTDs (i.e., precincts and wards -- the Census Bureau generically calls these Voting Tabulation Districts or VTDs), are available for a splits report. If a reference layer has been selected using the Map Layers, the reference layer will also be available for a splits report. You must select a reference layer to generate a report. Checking the reverse splits detection box will produce a report of the districts that split each reference layer geography, instead of the the reference layers that split districts. In the example, above, a list of each congressional district splitting a State Senate district would be generated. By default, the Splits Report generates a list of the split geographies only. Checking the extended report will generate a report of all geographies contained within a district, both fully contained and and partially contained within each district. In this report, split geographies are highlighted in red and an asterisk is placed next to the geography name. Geographies that are not split are displayed in black. The extended report requires two queries, one to identify split geography and one to identify non-split geography. The extended report may thus take significantly longer amount of time to run. When you are satisfied with your selection, click the Generate Report button to produce the report. To exit, click the close dialog window "x" in the upper right hand corner of the dialog box. 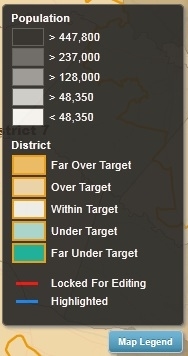 Districts can be highlighted in blue by clicking on the district on the Statistics sidebar on the right hand side of the mapping screen. Highlighting districts may be useful to identify small non-contiguous pieces of geography that often occur when working at the census block level.